As a ‘newbie’ to boat buying, we needed the proverbial “best of the best” salesman, one who knew everything about every boat we looked at, someone with more than the usual amount of patience to answer all our questions [often more than once], and one who had literally “been there, done that” regarding everything involving sailing. Ed Massey more than fit the bill. Easy going with an encyclopedic knowledge about sailboats, unflappable in the face of challenges, and someone who makes you feel at ease from the very first moment. He doesn’t simply answer your questions—he educates you. Absolutely a true professional in every respect. Ed’s staff is first rate, as well. Quite simply, Ed knows boats inside and out, he knows the boat manufacturers [personally], and he knows whom to contact for every imaginable boat issue. The folks he recommends are the best of the best in their business. They have earned his respect over the years and he has clearly earned their respect—just ask them. 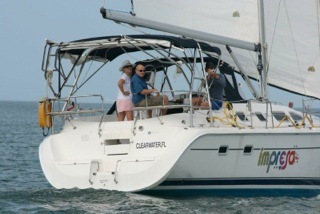 Our 2007 Hunter 41, Impresa, has turned out to be a great boat! Maybe a little big for a first “real” sailboat, but she sure does grow on you, and she is amazingly agile and easy to sail.